We've made it all the way to Mario Party 10, folks, and somehow Nintendo keeps managing to make it a fun experience. 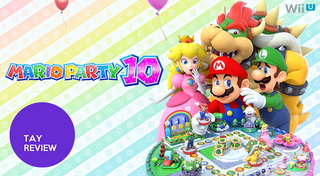 Released March 20th for the Wii U, Mario Party 10 makes sure to put the available hardware to good use. Beautiful graphics, motion-based games, GamePad-based games, and 5-player matches can all be found in the newest entry into the Mario Party series. This iteration does however play at lot like the last one. Some of you may say that's a good thing, and I know some of you will definitely say that's a bad thing, but I'll try to touch on all of the major points below that are fantastic, terrible, and anywhere in between. The first thing that stands out, much like all of Nintendo's first party games this generation, is the level of polish that has gone into this game. Mario Party 10 looks and sounds amazing. Art styles and ideas are borrowed from the equally polished Super Mario 3D World. I know that it has become a standard for Nintendo games to look this smooth, cheerful, fun, and colourful, but it's still always nice that they can consistently deliver. Mario Party 10 accomplishes what it has set out to do. It's fun. Sure, you may not like a few things about this new iteration, you may think it's missing some features, or maybe you're still pining for the old days of Mario Party games on the N64 (back in my day we'd drill holes into our palms with the control stick to win minigames). There's one thing that you can't deny with MP10. It's still fun. These were a big surprise for me. Aside from all of the Mario Party game modes, that involve boards and dice, there's a small pocket full of unique games and tournaments under Bonus Games on main menu. Jewel Drop is one of my favourites. It feels like a mashup between Bust-a-Move and Dr. Mario with physics thrown into the mix. This particular game can be played solo, or in a head-to-head battle mode. My next favourite is the Minigame Tournment, which is exactly as it sounds (go figure). It's set up as a classic tournament ladder, and you can get up to 8 people playing. Each round is an elimination round, and you progress by winning minigames (the same minigames found when playing other Mario Party 10 game modes). There are a few other Bonus Games that are fun to play with others as well. You can play as Spike. My one and only gripe with the Mario Party 10 minigames is that you don't get to play them enough. This is the same issue that plagued Mario Party 9. Mario Party 1 through 8 had each round finish off with a minigame. Mario Party 9 and the newly released game that is being covered by this wonderful review, Mario Party 10, only have minigames when you happen to land on the Battle Spaces on the game boards. That means you could theoretically (mandatory boss battles aside) make it to the end of the map and not play any minigames against your compeititors. What kind of Mario Party is that? I can't ruin any friendships if I'm not forced into several head-to-head, mind-numbingly frustrating mini games round after round! I will start by saying that the Bowser Party mode is extremely fun. In this game mode, you can have up to 5 players (a la Nintendoland), four players with Wii remotes, nd a fifth rocking the GamePad as the titular Bowser player. Unfortunately, there are only 3 maps to choose from, so you work your way through them quickly, but each map does have it's own uniqueness to it. The four regular players each take turns rolling their dice. This time they're working together to try and make it to the end of the board to reach the Star before Bowser can stop them. Once Bowser's turn rolls around (pun intended), you toss multiple dice to try and catch up to the other players. If Bowser manages to catch up, then it's minigame time. The minigames in the Bowser Party mode are all about survival. Each player has a set amount of hearts that are lost every time Bowser is able to hit/catch/stun/etc. you in the mini games. There are opportunities on the board to gain hearts back, but don't always count on it. My biggest issue with Bowser Party game mode, is that Bowser always seems to win. I've played solo games as Bowser, and even played a few rounds with another player. Now, the story might be different if it was a room full of people and no one had to rely on the dopey CPU characters, but unfortunately I didn't have a chance to find that out. The main reason it took me a few days to get this review out was because I didn't own any of the amiibo found in the image above. The whole amiibo Party mode is completely locked up. I just had a big grey block on my screen that I couldn't access until I spent another $13 on one of 9 amiibo that are compatible with Mario Party 10. Even after tapping to get into the amiibo feature, it was fairly lackluster. You play a classic Mario Party mode (where you go around a board collecting coins to buy stars), but they're just square boards with relatively few tiles. It didn't feel like classic Mario Party, and I'm still bitter you have to spend (at least) $13 to even get the door open. I want to say that I'm surprised by the lack of online features, but sadly, with Nintendo, I can't say that. Hopeful that they would continue their recent online successes of their other first-party hits (Mario Kart 8 and Super Smash Bros. for Wii U), the exclusion of any sort of online play seems like an oversight for Mario Party 10. Surely there could have been some sort of matchmaking that could pair 4 strangers up. Unfortunately, another entry into the Mario Party series is shielded from online multiplayer. The main portion of Mario Party 10 plays like a repackaged Mario Party 9. It has new features that include the GamePad for 5-player games, and the new Bonus Games are a fun addition, but mostly it still feels like Mario Party 9. Also, the fact that a portion of the game is locked down unless you have a compatible amiibo (which I didn't when I first picked up this game) really puts a damper on things. Not only did I spend $50 ($60 CAD) on a rehashed Mario Party 9, a large portion of the new content was blocked until I spent another $13 for an amiibo. With all of that being said, however, the game was still thoroughly enjoyable. Each game that I played, whether it was solo or with friends, I still walked away entertained. Which is exactly what Mario Party is supposed to do. Right now, everyone should just be on the fence about Mario Party 10. It's certainly not a definite "go out and buy", but on the other hand it's not a terrible game. If you skipped 9, or you really enjoyed it, then go out and grab yourself a copy of 10. If that wasn't exactly your cup of tea and you're waiting for a more classic Mario Party game, save your money for the inevitable Mario Party 11.